Showcase your beer logo with this awesome template of a dude at a bar with a beer mug standing on a wooden table, it's a really cool mockup that'll help you build a much better image marketing. Drag n' drop a jpeg or png over the interface, we'll process it for you in just seconds. 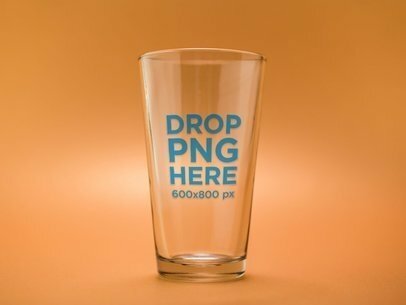 Try another Beer Glass Mockup here! Do you have a new beer logo design and do you yet don't have a cool way to showcase it to your customers? Use Placeit! 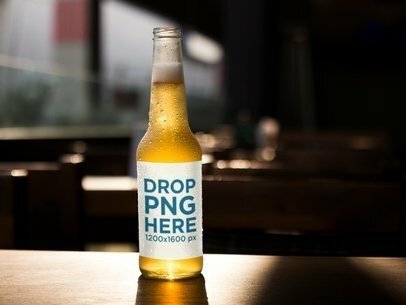 This mockup features an empty weizen beer glass against an orange background, you just need to drag-and-drop your jpeg or png and wait a few seconds to see it merged. That's all! 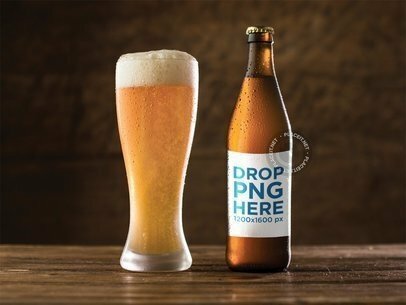 Try another Beer Glass / Bottle Mockup here! 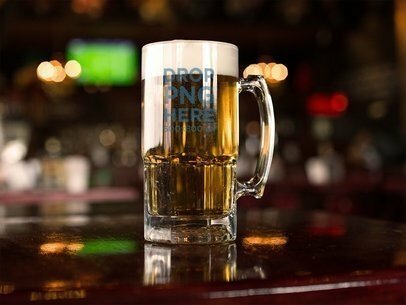 Check out this awesome template of a beer mug on a bar, there are lights in the background. This one is a perfect visual asset for you to showcase your latest logo! Drag-and-drop your image file on the interface, we will process it for you in just seconds. 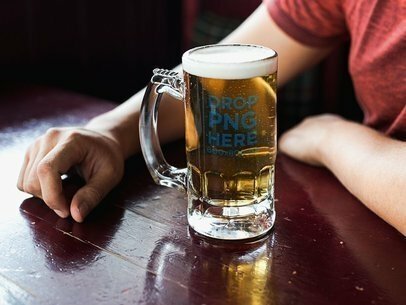 Try another Beer Mug Mockup here! 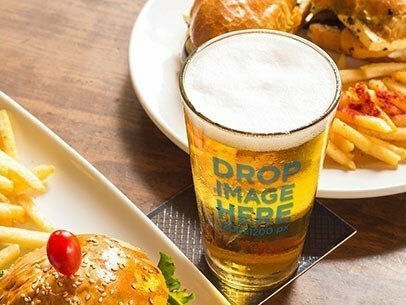 Check out this classic beer mug lying on a bar, it's an excellent choice if you are looking to showcase your beer logo with a beautiful image. Start now by dragging and dropping a jpeg or png file on the interface, it'll be merged in just seconds automatically. Use Placeit and see how your revenue grows! 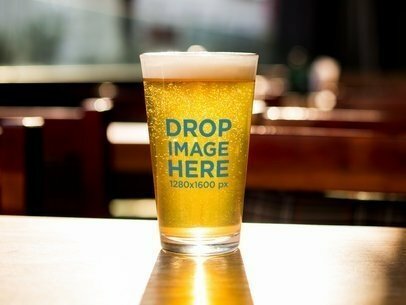 Try another Beer Glass Mockup here! 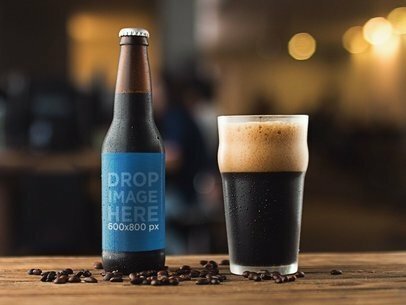 Start promoting your awesome beer brand with Placeit's beautiful mockups! This one features a beer bottle label while a glass of witbier beer is near it, they're both on a wooden surface, it's just beautiful. All you have to do is drag-and-drop an image file on the interface, we'll process it for you in just seconds. 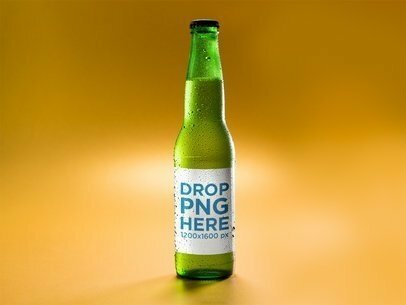 Try another Beer Bottle Mockup here! Start promoting your awesome lager beer with this beautiful template of a green lager beer bottle standing against an orange background. All you need to do is drag-and-drop your image file on the interface, it'll be automatically processed. That's right, after a few seconds you'll see your beer label on this cool beer bottle. Isn't that great? 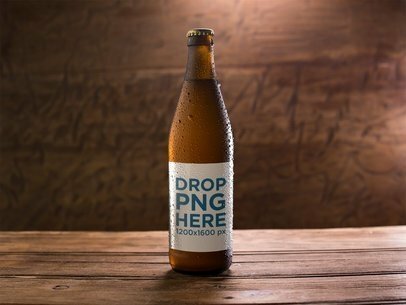 Try another Beer Bottle Mockup here! 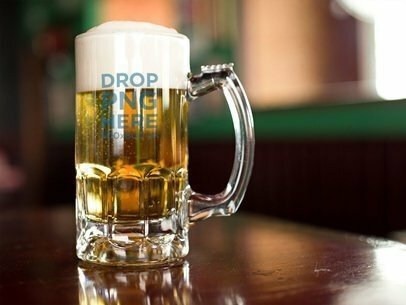 Start promoting your beer company with Placeit! This mockup features an amber weizen beer bottle on a wooden table, it's an excellent choice for you to showcase a beautiful beer label. Start now and make your revenue grow! Drag-and-drop your image file on the interface, it'll be merged in just seconds. Try more Bottle Mockups here! 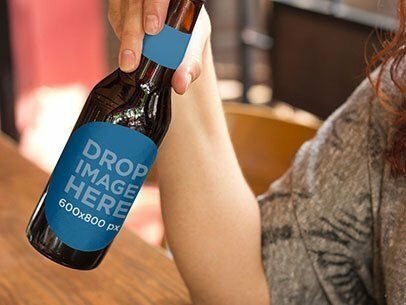 Start promoting your awesome beer label designs with Placeit! 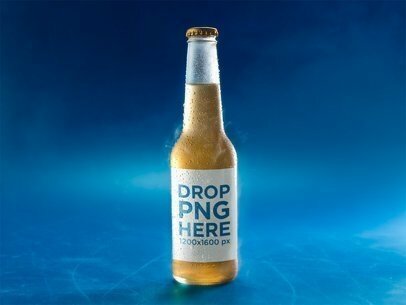 This mockup features a very cold bottle of lager beer on a blue surface, it's excellent to promote your latest beer variety. All you have to do is drag n' drop an image file on the interface, we will process it for you in just seconds. Start now and make your business grow! 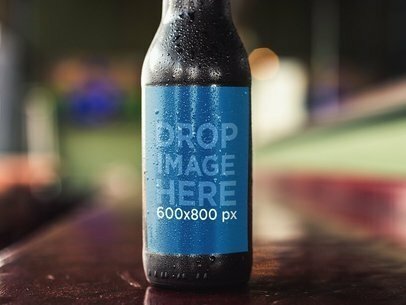 Try another Beer Bottle Mockup here! 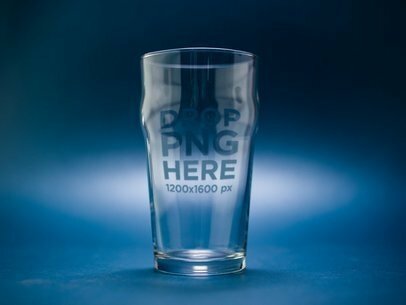 Start showcasing your awesome beer design with this mockup of an empty nonic pint beer glass against a dark blue background and make your customers love you! Promote your product right now, all you have to do is drag-and-drop an image file on the interface, it'll be merged in just seconds. 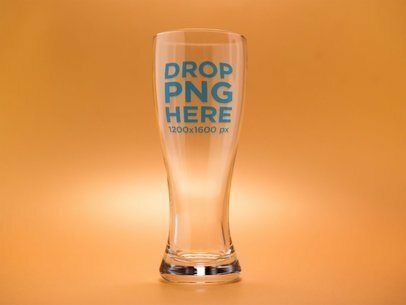 Try another Beer Glass Mockup here! 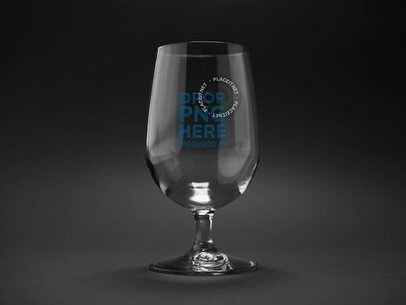 Showcase your awesome brand of beer or brandy with this beautiful snifter glass mockup! It's everything you need to start promoting your elegant beverage. Start now by dragging and dropping your image file on the interface, we will merge it for you in just seconds. That's right, just seconds. Amazing, right? Start selling more with Placeit! 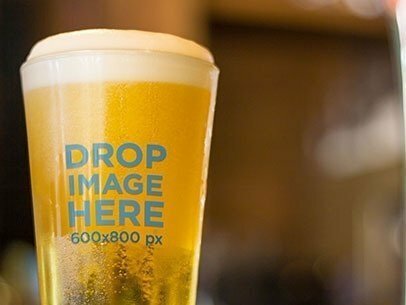 Try another Beer Glass Mockup here! 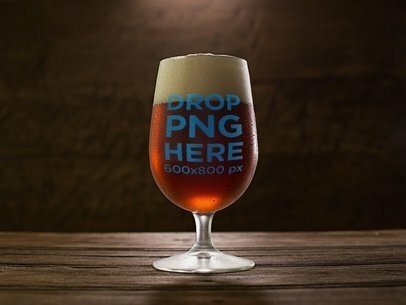 Promote your latest beer brand with this awesome mockup of a snifter beer glass filled with belgian ale on a dark wooden table, it's a great option to make your business grow. All you need to do is drag-and-drop a jpeg or png file over the template, we will process it for you in just a couple of seconds. Use Placeit and see how your revenue grows! 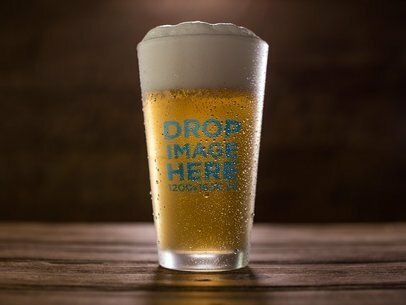 Try another Beer Glass Mockup here! 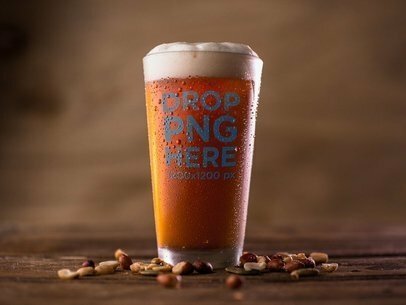 Check out this awesome mockup featuring a pint of red beer standing on a wooden table, near some peanuts. All you have to do is drag-and-drop your image file on the interface, it'll be merged immediately. Promote your beer brand in a smart and creative way with Placeit! 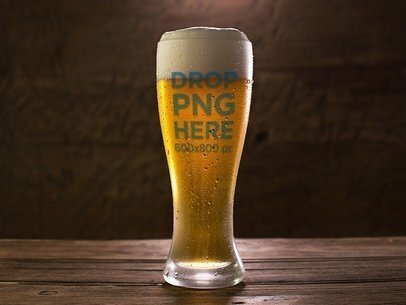 Try another Beer Glass Mockup here! 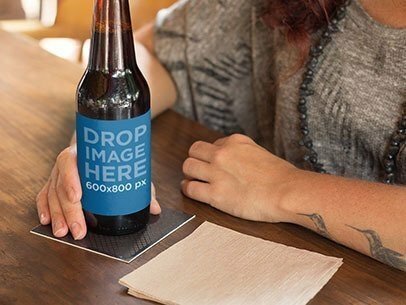 Use this label mockup featuring a glass of beer standing on top of a table at a restaurant to display your latest design within context and appeal to potential viewers and consumers right away! To customize this original mockup all you have to do is drag and drop an image of your choice onto the template and let Placeit do the rest of the work for you. In just a matter of minutes, you will get an incredible image to start showcasing your ideas to everyone! So what are you waiting for? Start using Placeit's mockups today! See more Label Mockups here! Showcase your latest business ideas and designs within context with the help of Placeit's label mockups and leave a lasting impression on your specific target market. 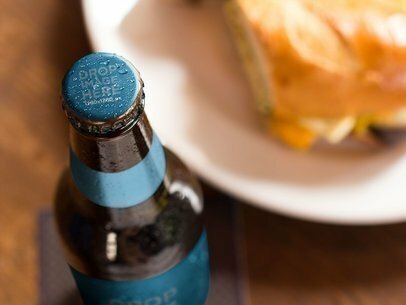 This label mockup features a beer standing on top of a table at a restaurant next to a sandwich. Customize this mockup to whom pretty much anyone can relate to by simply dragging and dropping an image of your design onto the template and let Placeit handle the rest of the work for you. Believe us when we say that your designs will definitely stand out from those of the competitors once you start using label mockups as part of your visual marketing campaign! See more Label Mockups here! This label mockup features a tattooed, hipster woman having a beer at a bar. Use this mockup to help you advertise a new product or design and leave an impression on your consumers at a glance. Imagine how your ideas will look portrayed on the beer bottle she holds in her hand? Pretty cool right? To customize this image all you need to do is input a URL or drag and drop an image of your choice onto the template to create an amazing visual asset within no time! Advertising your products and new designs had never been this easy, but thanks to Placeit's marketing tools now it is! 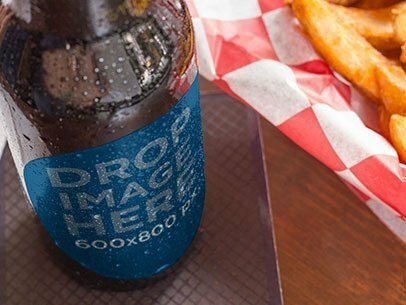 This label mockup features a beer bottle standing on top of a table at a restaurant next to a plate of fries. Customize this mockup by adding an image of your choice or by inputting a URL address onto the template and let Placeit do the rest for you! With this label mockup your ideas will shine, so don't hesitate and start using it straightaway! What better way to advertise your newest product or design to the world, then with the help of this amazing beer mockup from Placeit? This photo mockup features a young woman having a beer at a bar. Customize this real-life scenario mockup by adding an image onto the template and see how your consumers react! Improve your visual marketing campaign today without needing to invest huge sums of money on it, all you need to do is make Placeit an essential asset of your marketing strategy! Pretty easy right? Market your business latest product in a fun, attractive way using Placeit's stock photo mockups and catch your consumers attention right away! 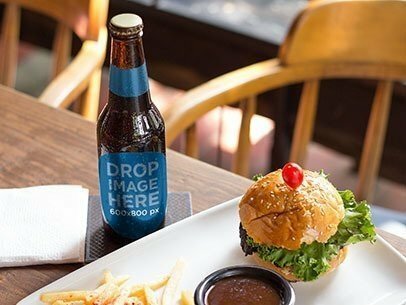 This label mockup features a beer placed on top of a restaurant table next to a hamburger plate. Make this great label mockup part of your marketing strategy to help you advertise your ideas within real-life context and boost your visual marketing campaign in no time!